With the availability of imaging modalities at most institutions, there is still a place of destructive procedure in few selected cases. 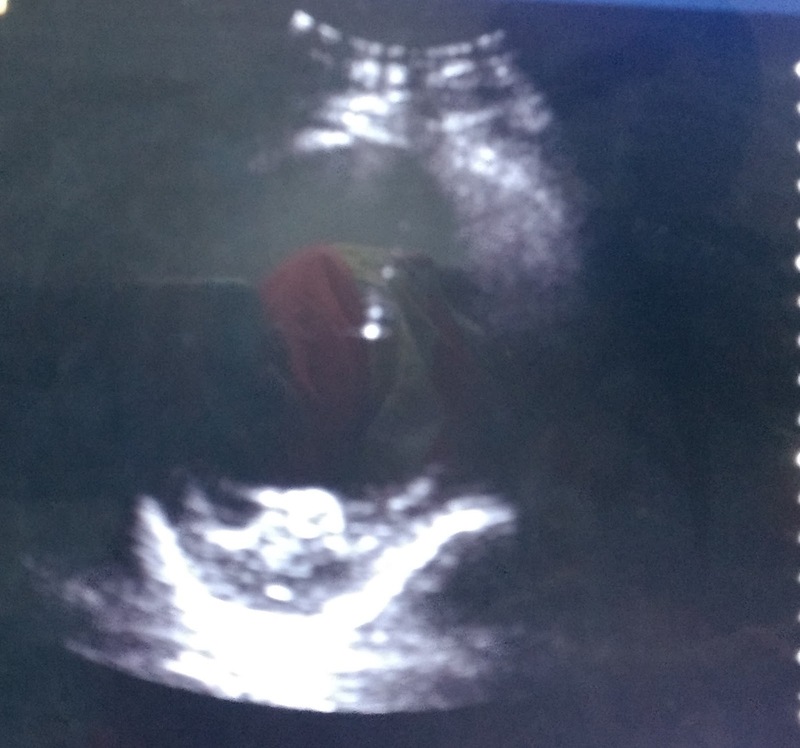 The authors present a case of ultrasound guided transabdominal cephalocentesis in a fetus with gross hydrocephalus and myelomeningocele. This fetus was delivered vaginally and thereby avoided cesarean section for a baby which had poor prognosis and ensured a better obstetric future and morbidity outcome. 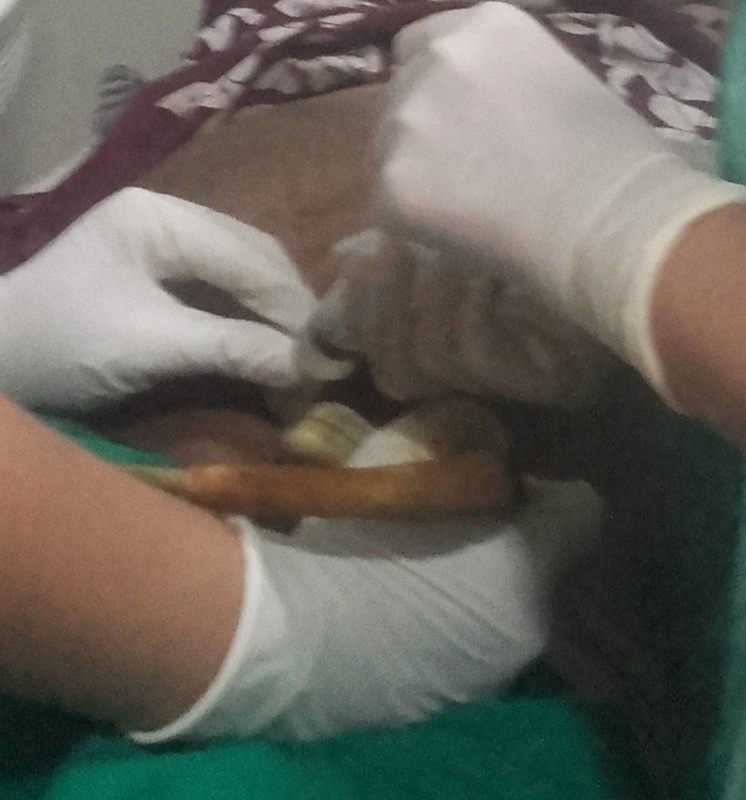 Cephalocentesis is a procedure by which the excess cerebrospinal fluid is drained from a fetal skull with hydrocephalus thereby permitting vaginal delivery. It is a rare procedure offered to pregnant patients having a hydrocephalic fetus which is expected to have a poor prognosis after delivery, such as a still birth or an early neonatal death. A 30 year old primigravida, with history of infertility treatment for past 10 years was registered at our hospital at 13 weeks of gestation. Present pregnancy was a spontaneous conception. At 21 weeks of gestation she was diagnosed to have a malformed fetus. Ultrasound report was suggestive of moderate degree of hydrocephalus with Arnold Chiari type II malformation and a lumbar meningomyelocele. The prognosis was explained to the patient and relatives. Patient was lost to follow up thereafter. At 36 weeks of gestation patient presented to our emergency department in active labor. On examination she was hemodynamically stable. On per abdomen examination uterus was full term with breech presentation. Fetal heart sounds were present 140 beats per minute, regular, and uterine activity was 1/10/10-15. On per vaginum examination membranes were absent, cervix was 3cm dilated 40% effaced with buttocks as presenting part at -2 station. Urgent ultrasound was repeated for biparietal diameter and head circumference. USG report was suggestive of single live intrauterine gestation with breech presentation and BPD of 10.6 cm and head circumference of 41.1cm. Patient and relatives requested a vaginal trial. Decision was made to do a cephalocentesis. A liberal episiotomy was taken and the breech was delivered in the labor room. Cephalocentesis was attempted per vaginum which failed (figure 1). Figure 1: Attempted cephalocentesis per vaginum using spinal needle. Hence decision was made to perform ultrasound guided transabdominal cephalocentesis. Ultrasound probe was used to visualize the fetal skull and brain. 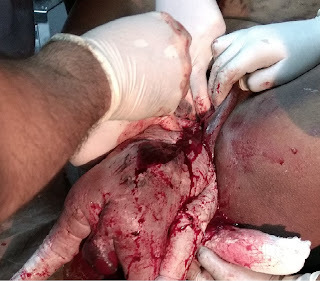 An 18 guage spinal needle was inserted transabdominally under vision into the occipital/posterior horn of lateral ventricle near lambdoid sutures away from placenta and 250 ml cerebrospinal fluid was aspirated taking care not to damage any maternal tissue (figure 2 and figure 3). Figure 2. USG guided transabdominal cephalocentesis. Figure 3. USG showing needle placement. The delivery was uneventful and a fresh still born male of 2.460 kg was delivered. The cervix was traced; there was no evidence of any cervical tear. Cesarean section along with its complications was hence avoided in a primigravida with a fetus which had poor prognosis post delivery. Arnold Chiari type II malformations have an incidence of 1:1000 total live births. Studies have shown that this condition has poor prognosis and it is a life threatening abnormality. In survivors, 15% of newborns die by the age of 3 years and one third have permanent neurological disability. If diagnosed before 20 weeks of gestation, as it involves serious associated malformations which are incompatible with life then termination of pregnancy is an option. After 20 weeks of gestation fetal surgical procedures can be offered. These include intrauterine fetal surgery for repair of myelomeningocele either by open or an endoscopic surgery. These surgeries require expertise and resources which are not available in developing countries. At term elective cesarean delivery can be offered to patients in whom fetal malformations are likely to cause dystocia or where immediate neonatal surgery will result in better neonatal outcome. Hydrocephalus is the most common congenital malformation that can lead to obstructed labor. Obstructed labor can be managed either by cesarean section or an instrumental delivery. Cesarean section as compared to vaginal delivery has a increased risk of hemorrhage and infection. Unnecessary cesarean uterine scar is given to the patient, and hence in her successive pregnancies she is a high risk patient with a previously scarred uterus. In a malformed fetus where the poor prognosis has been explained, vaginal delivery can be done by vaginal cephalocentesis if it has a vertex presentation and transabdominal cephalocentesis in case of breech presentation as it is in our present case. In cephalocentesis a spinal needle is inserted in the uterus under ultrasound guidance and then advance further into the cerebral space to drain the excess CSF which will eventually reduce the size of head after which it is possible to conduct a successful vaginal delivery. Chasen S, Chervenak FA, McCullough LB. The role of cephalocentesis in modern obstetrics. Am J Obstet Gynecol 2001; 185(3): 734-6. Gollop TR, Eigier O. Early prenatal ultrasound diagnosis of fetal hydrocephalus. Rev Bras Genet 1987; 3: 575-80. McLone DG. Continuing concepts in the management of spina bifida. Pediatr Neurosurg. 1992;18(5-6):254-6. Kahn L, Mbabuike N, Valle- Giler EP, Garces J, Moore RC, Hilaire HS, et al. Fetal Surgery: The ochsner experience with in utero spina bifida repair. Oschner J. 2014; 14(1):112-8.